THERE IS something special about an island villa you can only get to by wading through warm water. Take off your shoes and feel the sand between your toes -already you know you are in for a pretty special experience. Sitting just off the southern tip of Sri Lanka, this private villa has a history as exotic as the island it sits on in glorious solitude. Built in the 1920s by a self-styled Count, author Paul Bowles came here to write and loved the island so much he bought it. As dotty as the Count Mauny- Talvande may have been, he showed great vision in building this villa in an octagonal shape so that all rooms could soak up the view. Today the 5 bedrooms also share a mix of colonial and contemporary furniture, while a white tiled floor thoughtfully cools your feet. Verandas wrap their way around the exterior providing plenty of places to sit and dine. In the garden there are secret spots while an infinity pool under trees is simply dreamy beyond is two and a half acres of tropical paradise to call your own on Sri Lanka's only privately owned island. A staff of five caters to your every whim. Know that as well as Bowles many other writers, statesman and royals have been there before you. 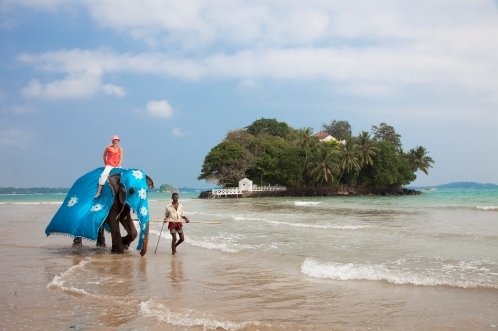 Taprobane Island is one of a small portfolio of privately owned villas in Sri Lanka called The Taprobane Collection. They have been chosen by the owner who has a passion for discovering hidden gems and turning them into sublime pieces of paradise. The emphasis here is on "finding the extraordinary and not the ordinary" and the four current properties (including one small hotel, The Sun House) all have a sense of history, an irresistible charm and exceptional locations. The Beach House, which UK Tatler once dubbed "The best beach house on earth" at Seenimodera in Tangalle. It was once the retreat of the US artist and naturalist Douglas Johnson who now lives mainly in n New Mexico. The four-suite private Dutch House is high on a hill above the World Heritage- listed fort of Galle. It has a long heritage and was originally built in 1712 and the period Dutch antiques you'll find inside reflect its history. Staff are as discreet and charming as a country house of this vintage demands. The Luxury Travel Bible is glad to hear that the owner continues to look for further serendipitous locations - we can't wait for the next one.